We packed up and headed off for a weekend at Disneyland, certain that our children would have an amazing time. What we didn't expect was to see their faces light up over something we almost skipped entirely in favor of an afternoon break. My husband, children and I recently had the amazing opportunity to visit Disneyland and California Adventure for the first time as a family. We kept the entire trip a secret from our kids and couldn't wait to see their faces when we told them where we were going. I knew we would have a wonderful time. I was certain that Cars Land would delight them. My daughter would, of course, love to see each of the princesses. And my son would want to stay in Mickey's Toontown forever. But one of the things that they loved most was one thing that we almost skipped in favor of heading back to our hotel room for a mid-day break. But, time truly flies at Disneyland and we didn't want to waste a single moment, so we pushed through and made our way to watch the holiday parade that has become a tradition at Disneyland — A Christmas Fantasy. And wow, am I happy that we did! There, all in one place, they watched all of their favorite characters and some new ones (they hadn't met yet) float by, celebrating all of the magic of the Christmas season. They were enthralled by the music, floats and holiday cheer. 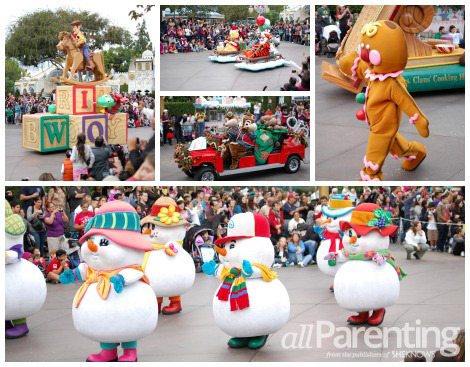 From dancing snowmen, gingerbread men, reindeer and Santa on his sleigh, to Mickey and Minnie Mouse ice skating hand-in-hand, they were engaged from beginning to end. And I couldn't decide where to look... at their beaming faces or the parade. I was so happy that we didn't miss the wonder of the holiday parade. Your family can catch the magic of A Christmas Fantasy, now through Jan. 6, 2013.